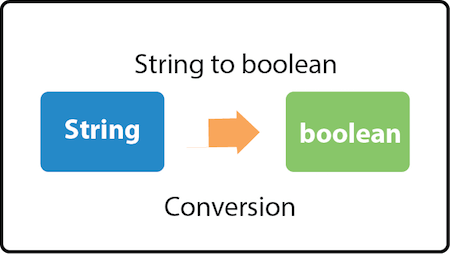 We can convert String to boolean in java using Boolean.parseBoolean(string) method. To convert String into Boolean object, we can use Boolean.valueOf(string) method which returns instance of Boolean class. To get boolean true, string must contain "true". Here, case is ignored. So, "true" or "TRUE" will return boolean true. Any other string value except "true" returns boolean false. The parseBoolean() method converts string into boolean primitive. Let's see the simple example of converting String to boolean in java. The Boolean.valueOf() method converts string into Boolean object. Let's see the simple code to convert String to Boolean in java.